This year, we’ve been able to get an inside look at an important question: How ready are American cities to fight climate change? The answer is important to the future of our planet. Globally, cities are the source of 70 percent of all greenhouse-gas emissions, particularly via the cars urban dwellers drive and the energy required to heat and cool their buildings. U.S. cities are responsible for a disproportionate share of the total. The cities were competing for a capacity-building package of staffing and technical assistance valued at more than $2.5 million. This was a competition for big cities – the 100 largest by population – and all of them were already taking climate change seriously. We announced the 25 winners on a rolling basis, starting with Atlanta and Seattle in September and finishing with San Antonio and Austin last week. 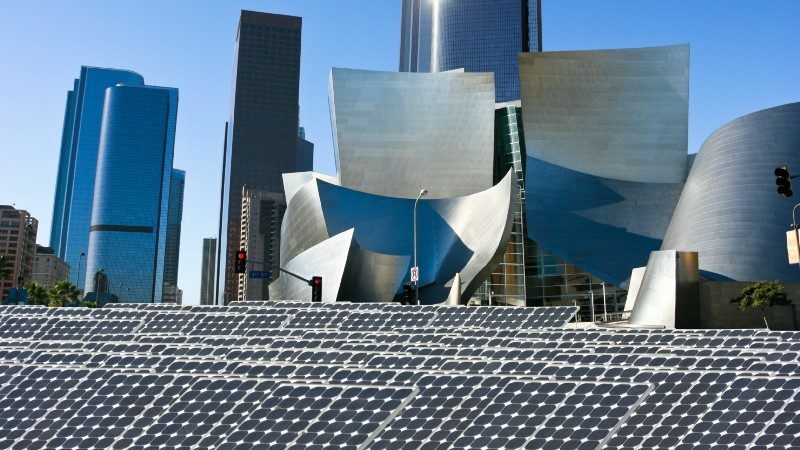 The point of the Climate Challenge is to support cities that are poised to make the biggest impact in slashing carbon emissions by supercharging their efforts. It’s a new approach in the city climate field, focused on immediate action, which is exactly what scientists say is needed to avoid the most calamitous impacts of climate change. So the focus is on building local capacity to deliver on bold pledges — especially in the buildings and transportation sectors, which are responsible for the bulk of greenhouse-gas emissions in most U.S. cities. The Challenge also represents a first for the foundation — a collaboration between the Environment and Government Innovation teams. While the Environment team brings deep experience promoting climate action around the globe, Government Innovation has supported hundreds of mayors and cities to get big things done by leveraging innovation, data, collaboration, and inspired leadership. In each city that applied, we looked behind the curtain of the city’s climate commitments. We met with the mayor to discuss priorities, opportunities, and barriers to climate action; convened with the chief sustainability officer and other key department leaders to understand how well they coordinate; and consulted with local businesses, community groups, universities, and other stakeholders to get their perspectives. A team of experts on buildings, transportation, energy, and implementation traveled with us, and helped us evaluate each city’s work plan for its potential to reduce carbon pollution. What was clear from our visits is that there’s a critical mass of U.S. mayors who are demonstrating ambition, commitment, and the potential to make a big impact on reducing emissions in their cities. A handful of cities already are on track to achieve their ambitious local targets. 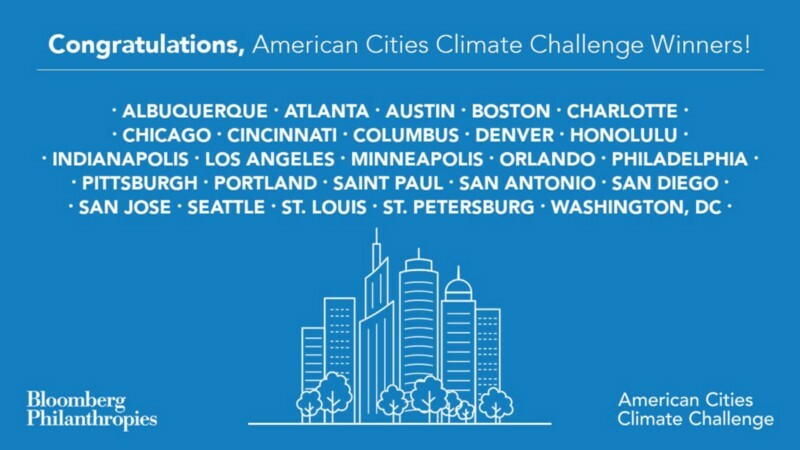 Together, the 25 winning cities are set to deliver an important share of the greenhouse-gas reductions needed for the United States to meet its Paris Agreement target. Still, many of the cities we visited — both those that won the challenge and those that didn’t — face some real challenges when it comes to turning their pledges into action, and ultimately impact. Barriers facing cities are political just as much as technical. Even in places where climate is a clear priority, the issue still competes for attention with many other pressing concerns, such as public safety, homelessness, and poverty. Cities with the greatest success on climate have been able to demonstrate how climate action improves lives for citizens, whether it’s improved commutes, cleaner air, or cheaper energy bills. Cross-agency collaboration is critical. Generally speaking, we found weaker relationships than we expected between managers in charge of sustainability and those in charge of buildings, transportation, and other key agencies. In fact, in some cities, our visit apparently sparked the very first such meeting among them. These players and other key partners, both in and out of government, will need to strengthen their collaboration muscles in order to meet their mayors ambitious targets. Sustainability offices are hungry for staff capacity. The people in city government whose jobs are most clearly focused on climate change are stretched thin. We found, on average, between three and five people in city sustainability offices. While the 25 winning cities will get reinforcement in the form of a full-time employee and other staff supports, they’ll need to be creative in order to add additional capacity. One way to do it: Look for partnerships with other agencies or local organizations. Partnerships with businesses, universities, and others will be critical to city success. Much of the action required to slash greenhouse-gas emissions will need to come from outside City Hall — from building owners, utility companies, transit users and bicycle riders, and many others. It will be difficult for cities to realize their ambitions without cultivating strong partnerships. Cities need more and better data to measure the impact of their climate work. Having data to set benchmarks and measure progress over time is critical to the fight against climate change. We found that, while cities have some of the data they need, a lot of work remains. For example, many cities do not have access to downscaled data on energy usage. They need to move quickly to improve here — and they’ll need to share tips and methodologies with each other as they reach further. Mayors and their staffs are ready to get to work. Everywhere we went, we were impressed by how mayors are raising their ambitions in terms of what’s possible in cutting emissions. Already managing the impacts of climate change such as heavier rains and flooding, cities are acting with urgency. We were humbled by the dedication of city staff charged with making plans happen. This work is enormously important — and cities are ready to go. Overall, we came away from these visits hopeful about the future. When you add the bold leadership of mayors, the dedicated work of city staff, and the new capacity and coaching that 25 cities will be getting from Bloomberg Philanthropies, there’s a powerful force for change in American City Halls.